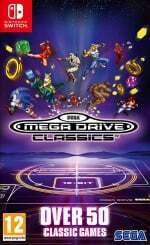 Sega Mega Drive Classics (or Sega Genesis Classics for our chums in North America) has finally made its way to Switch today. To celebrate, Sega has released a shiny new launch trailer which we've lovingly shared for you above. You likely know all about this one by now - and may well have started playing your copy already - but for anyone who's missed out, the game allows players to revisit more than 50 Sega hits across a crazy number of genres. We're talking arcade, action, shooters, beat 'em ups, puzzlers, and the odd hidden gem, all of which can now be played on the go. "It's not an entirely definitive selection and there's bound to be the odd gem you recall from your youth that isn't included for one reason or another, but on the whole, it's really hard to imagine a better array of games." Just to be clear, the game is available right now in Europe, and launches tomorrow (7th December) in North America. Have you been looking forward to getting your hands on this one? Leave a comment below and let us know if you've ordered yourself a copy. Why oh why doesn't Nintendo look at this and go, hmm, thats a good idea! Is it weird that I am more excited about getting this than Smash Brothers?!! I think it's my age!! Going to be a while before I can get to this but seems like an awesome deal! @Bunkerneath agree 100% with that last part. Top 50 Snes games, put em on a cart, charge full retail $60 for all I care and that's a day one easy purchase! @TheFanatic In general, yes. But their latest Sega offering, the Sega Genesis Flashback HD, even though it's still not quite where it should be, really isn't half bad compared to all the crappy Sega stuff they released before that latest outing. But because of their well-deserved bad rap, nobody is even going to give that a second glance, which is kind of a shame, really. But I guess that ultimately, they've got themselves to blame for that. I will be picking this up tomorrow when I go and pick up smash bros. I am getting it sole for Phantasy Star and Shining Force so all the other games are a bonus to me (even though I own a majority of these on steam having them on switch for portable play is a massive reason I am double dipping). It's always a shame to see Sonic 3, and Sonic & Knuckles absent from these collections. Are there still music licensing problems to these days? I got my copy early and I have to say this is a great collection of Sega games. And I've noticed some button lag in certain games. Particularly sonic 2. Nothing game breaking but its noticeable. No virtual console, this is definitely the next best thing. I still don't know why exactly they never include Sanic & Dankles or Sanic3 in these collections... What gives? Anyone else having trouble connecting to the eShop? I'm trying to cave and purchase this even though I know all of my time is going to Smash, but it keeps telling me it can't display the page. Maybe this is a sign from God. I live on the east coast and my target already had it out on shelves. Anyone else see it at their stores? Kid Chameleon is a true gem. Great music, a handful of transformations, and multiple pathways through what seems like hundreds of stages so that no play through needs to be the same if you don't want it to be. A true competitor to Mario back in the day. Does anyone know how the multiplayer works? Similar to Nintendo Switch Online? In Kid Chameleon 2P, each player makes their own progress through the game, so either you're watching Player 2 run through the stage you just beat, or in theory they could be stuck on a level and you leave them in the dust. The game is so massive that it makes more sense to just play 1P and "pass the controller." Anyone know if that's possible? @ThanosReXXX Frankly, I had no idea there was even a half decent AtGames console. They are all so similar it’s not worth my time. @MagnaRoader I don't think there's been a straight answer from Sega on this one, but supposedly it has to do with the (some?) of the music in Sonic 3 (& Knuckles) being credited to Michael Jackson. Due to that the estate is holding on the the rights of that music and Sega isn't able to offer it. The only reason I can think of that it was included in previous collections is that perhaps MJ didn't keep Sega from including the game, despite holding rights to the music. As far as I know this is speculation though, unless someone can find some official statements somewhere and post that here. I was going to buy this, but just saw that SouljaBoy has a new games console out that has SEGA playable, so yea, it's a hard pass now. I want this game. But I have months of smash to think about first. @OfNullAndVoid Yes, Jackson did do some of the music for Sonic 3, even though he is not visibly credited in the game (most likely due to his request). I’m pretty sure he didn’t care if it was rereleased because he wasn’t credited, but celebrity estates can be ruthless. "Just to be clear, the game is available right now in Europe, and launches tomorrow (7th December) in North America." the german translation is terrible, half of the menu items arent even translated or translated wrong with spelling mistakes. and you cant even change the language without changing the whole system language of the switch.. I remembered getting a few free Sega games on steam at one point. I opened up the Sega Genesis Collection through steam and noticed the 4 games I had were the only ones on the shelves. If all versions are build off the same code, that could mean that it's easy to add games, so I'm hoping that, if Sega ever gets the rights sorted out for some games, that they'll be able to add them through a simple update. So I'm keeping my fingers crossed for Ecco, Sonic 3, and Wonderboy. The steam version on PC is far superior - it has Ecco and most importantly - Sonic 3 and Knuckles and Mod support. They were on other console editions of the same bundle. Also, no Wonderboy titles are planned for SEGA Ages. This is ugly SEGA, very ugly. You gotta explain this one, because you have no good reason to withhold those amazing titles from the Nintendo demographic. Especially after 2 awesome indie releases on the eShop. This is my treat for now as I’m saving Smash and Katamari for Christmas. Can anyone recommend a region where downloading it is cheaper than the uk? Now all we need is the Atari Flashback Collection to hit Switch and we will have the best of all 3 worlds!! Nintendo, Sega and Atari classics on the same console!!! Whoa!! Unbelievable! @RichyM Right the with ya bro😂😂 online Streets of Rage sounds ace. Again, Sega does what Nintendon't. They give us 16-bit games for a fair price. I'm gonna have fun with these games for a long time. Now I only wish for an HD Megadrive that uses actual cartridges and is not made by ATGames. Come on Sega, do it yourself! Quality will bring you money - this outsourcing won't, really. Have it on the PS4. It's really not a great selection of games but there are some gems in there. I 100% recommend anyone who gets this give Bio-Hazard Battle a look, I loved that game. @RichyM I don't care about smash at all. I just want this. I'm afraid so. Both games I was so looking forward to replaying but are missing from the switch version and I don't think Sega has explained why yet. Still to have this collection portable, I still say its definitely worth it. Also mine is the pal version but I think its the same as the ntsc vesion. I'm happy to have the Streets of Rage games on my Switch, but also glad I already have the Sega Ages version of Sonic as the lag when jumping in this collection is horrendous. I am double dipping on this and I don't care. I have it for my XB1 and loved playing Shining Force and Golden Axe again. I can't help but get it for my Switch. Love the Genesis. They are classics and wonderful games. I have very fond memories of monster world. Such a shame but yes I will probably spring for a ps4 version now just for those games. @TheFanatic Can't blame you for not knowing, but that's because of what I said: they've released so many lousy systems, that now that they're finally making a bit more of an effort, and are actually setting course in the right direction, no one will know, because it's buried under such a pile of crap and bad reviews, that it's hard to find, for any but the most informed people. Well, either that, or their reputation is already so damaged, that it doesn't even matter anymore that they've now released something half decent, because most of the people will already have lost faith in them. Me, I just keep track of all these retro/emulating systems, and as soon as an actually good system releases, I might just be triggered to buy it. Well you came in to start the 'better than AtGames crap'. Congratulations. But I was obviously being sarcastic. I'm actually NOT one of those "All AtGames stuff is crap" people, seeing as I'm actually quite interested in the steps they're now finally taking to ensure better quality Sega emulation, so I'll be keeping an eye on them. On my radar. Landstalker, Gunstar Heroes, Biohazard Battle...those three alone make it worthwhile for me. @Zelda79 I know the first phantasy star isn't included cause it was a Master System game. @presenttense All three Ecco games, Eternal Champions, and Sonic 3 & Knuckles...AND Sonic CD as a bonus. Plus the mod support, like you said. The Steam release truly is the definitive version. Still bought it for the Switch (digitally). 51 Genesis games for $30 is a good deal. There’s still no good reason for the two Wonderboy games to be missing from the Switch version, though. They own the IP. It irritates me that they didn’t even replace them with anything. @kobalt good to know. I only played through the dragon's trap last year, which I loved. I played dragon's lair briefly. Looking forward to playing more of the series! I'm not a big Sega Fan, but this Collection is awesome. Had a lot of fun in the last three days and now it's weekend and I invited some friends to play the s;¡| out of this game. Hopefully they will add more games, because there is still room in the Digital shelf. @ThanosReXXX Yeah, so it's not a shame really. They deserve it. @Beatley82 : they're a world famous band, right beside The Rolling Toads. The theory that Sonic 3 is not on the Mega Drive collection because of Michael Jackson is not correct, Sonic 3 (and Knuckles) is available on Steam for the PC version of this game. I think it was not added to possibly be added as paid DLC or maybe to sell a second game featuring Mega Drive or Master System games. @RichyM There are probably different licensing agreements for different formats though.